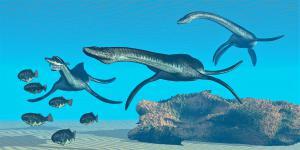 Author MAX HAWTHORNE Solves a 65-million-year-old “SEA MONSTER” Mystery. 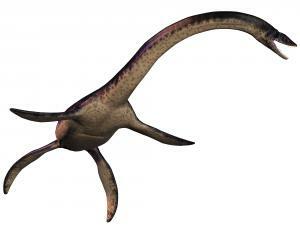 Artist’s depiction of the 45-foot plesiosaur Elasmosaurus platyurus. Artist’s depiction of plesiosaurs pursuing a school of fish. Plesiosaur skeleton, from Plesiosaurs Neo, by Prof. Ryosuke Motani. Used with permission. Has the bestselling indie author of the KRONOS RISING series answered the question: Why did plesiosaurs have such long necks?